Posted By PA Breast Cancer Coalition on June 15th, 2016 at 9:03 am | 0 comments. 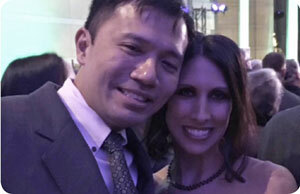 This month’s survivor spotlight, Nicole Lee, had a 6-month-old little boy when she went for her first mammogram. At age 40, she heard the words “you have breast cancer” and her first reaction was concern for her husband. Ryan, Nicole’s husband, lost his first wife to breast cancer. She was diagnosed when their twin sons were the exact same age as Nicole’s son Ashton – 6 months old. My life seemed perfect. I was working as an operating room nurse at a big trauma hospital and living life to its fullest. I was single and happy with wonderful friends and family. I was having lots of fun going out, attending destination weddings, vacations, social functions; whatever was going on, I was there. I did feel like there was just one thing missing. I wanted to fall in love and share my life with someone. But my expectations were so high! If someone was worthy of my heart they’d have to fulfill my long list of criteria and fit into my life. Then I met Ryan. It was the closest thing I’ve ever felt to love at first sight. He made me laugh. He was brilliant, witty, adventurous, kind, caring, and ambitious. I also immediately fell in love with his two six-year old twin boys, Ethan and Brandon. Ryan had lost his late wife to breast cancer in 2008. She was diagnosed when she was 32 and the boys were only six months old. She passed away only three years later. But Ryan was in a very good place now. He had done his grieving and had opened his heart and was ready to love again. I felt like the boys needed a mom and this was where I was meant to be in life. I was even happier than I had ever been! My family opened their hearts to the boys. I adopted the boys and in 2013 we got married on a beautiful beach in Cancun with 60 of our friends and family. We went about life holding nothing back. With Ryan’s history, he did not want to miss out on anything. It had been a tough few years for Ryan when his late wife was sick then as a single Dad. He now had such a zest for life and it went right along with my philosophy. After our wedding- I had started to feel like I wanted to have a baby. Ryan was hesitant but he eventually said yes. I think he wasn’t sure it would really happen. I wasn’t either. But five months after our wedding I was pregnant and I was the happiest pregnant person ever to walk the earth. I had an easy pregnancy and delivery. We had a healthy, beautiful baby boy, Ashton. I cherished every moment with him. I loved being his mom as well as a mom to Brandon and Ethan. We were very lucky to have my mom come and help whenever we needed her. She was just as in love with the baby and the boys as I was and loved to come and give me breaks. When Ashton was six months old I decided to stop breast feeding. Since I had turned 40 a few months prior I had scheduled my first mammogram. After my mom came down to stay with me, I suddenly didn’t feel like going to the appointment. I just didn’t want to leave the baby and figured I could wait a few more months. “Just go”, my mom said. “I’m here so just go get it done”. Off I went and I felt strangely excited like it was sort of a rite of passage. 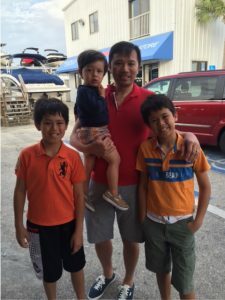 I was 40 years old with a baby and I felt good about where my life was. 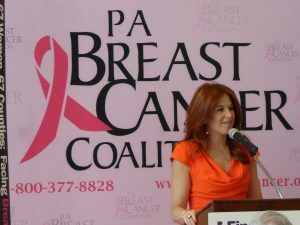 Dr. Jennifer Simmons – Chief of Breast Surgery, Einstein Medical Center Montgomery, shares Nicole’s story at a recent opening reception for the PBCC’s Photo Exhibit, 67 Women 67 Counties: Facing Breast Cancer in Pennsylvania at Einstein. met Dr. Jen Simmons and she was amazing. We actually cried together on that day I was diagnosed. She was there not just as a breast surgeon but as a therapist and a sounding board. It was a very dark time and very tough for my husband. Going through this once was hard enough but twice? I just prayed I’d be ok because the boys could not lose another mom and now we had a baby too. My husband went into “clinical mode”, and was there for every meeting. He made sure every aspect of my treatment was smooth and timely. I can’t say enough about the wonderful treatment I had at Einstein. I quickly began chemotherapy. Dr. Biermann, Michele Dooley, Barb Heinzmann and all the nurses in the oncology department were unbelievable. They were like a family to me and as much as I dreaded the chemo, I was happy seeing those faces when I arrived. I decided to save my hair with cold caps so my husband and the boys would not see me as looking sick. The regimen for the cold caps was very rigorous. My Dad with the help of Ryan facilitated the hats for me at every chemotherapy session. I wore the caps for NINE hours each time. It was a huge amount of physical work so a different friend each time would come to help out in addition to my Dad and Ryan. My mom came down to stay for every chemo to take care of the kids as I was sick for a while each time. After five months of chemo my MRI showed a “complete pathologic response” meaning all the cancer was gone. This was truly a miracle. I still was faced with a double mastectomy and reconstruction but the good news gave me extra strength. It was a very tough time but I got through it with the help of my family. I don’t know how people do it without support. My family and friends were there for me beyond my expectations. Other survivors, acquaintances and friends I didn’t even know I had came out of nowhere. My husband, my parents and my husband’s sister were there for every chemotherapy and surgery and I really didn’t worry about a thing except getting myself through it. It was difficult to put our wonderful life on hold and have to be faced with battling cancer. It’s been almost a year now for me and I’m doing great. You never know what will happen in life and I never take anything for granted. I pray that I will live a long, healthy life. My husband and I are back to our normal life again. I know this was a big bump in the road but looking at things now, my life is still perfect. Posted By PA Breast Cancer Coalition on June 1st, 2016 at 9:23 am | 0 comments. 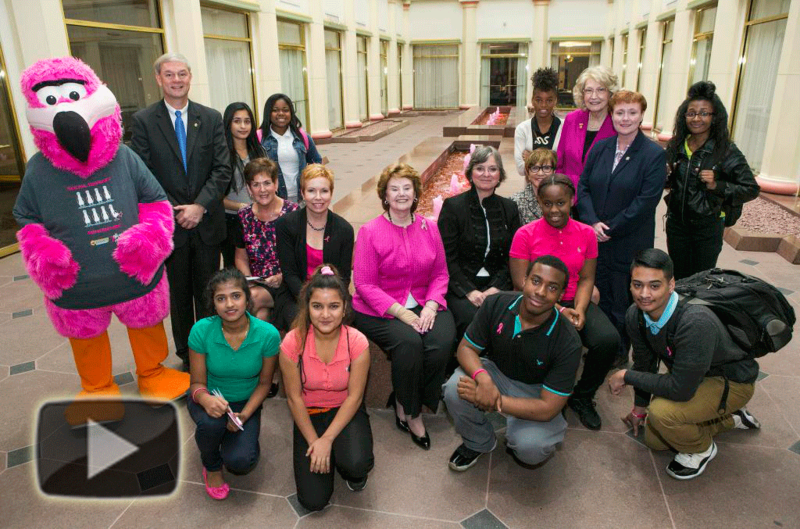 Over the past year, we at the PBCC have been privileged to work with a fabulous group of students from the Harrisburg School District through our CARES Program. The CARES Program (Community Advocacy & Research Education for Students) is designed for high school students grades 10-12 who want to further their knowledge in the science of breast cancer, careers in the healthcare field and participate in breast cancer awareness and advocacy as a community service. Click here to watch our video recapping this program and hear from the students who participated. We are thrilled to announce that we will once again be working with the Harrisburg School District for the 2016/2017 school year.